The DiabPro gives protection to feet, and everyday comfort to delicate skin with its fully lined sheepskin. The DiabPro has a slimline design that makes it perfect for everyday use. Designed for active users who use the boots when walking around the house or outside. Two Velcro straps fasten the boot securely across the top and can be adjusted to accommodate swelling. Seams are placed on the exterior for skin protection and softness. 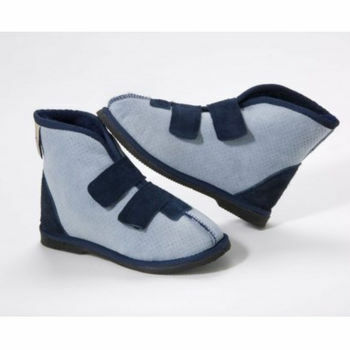 Sheep's wool accommodates all foot shapes by moulding around the foot, adding stability to everyday walking and protecting delicate skin from friction. The DiabPro boot is sold in pairs, and is available in Shear Comfort Natural (blue).